I worried about it, listened with growing alarm at each radio report, I checked symptoms online, discussed protocols with fellow workers who listened politely, bored looks on their bemused faces. I cleaned my bedroom, figuring that no doctor would be able to tend to me if she had to climb over various un-specifiable obstacles and piles of unsorted junk, I stocked up on bottles of sparkling water – my treat, abandoned in these economic times – and armed myself with a stack of books. If I were going to be stuck in bed it would be in the excellent company of J.M. Coetzee. Boyhood: Scenes from Provincial Childhood lay on my bedside table, the last nine pages waiting to be savoured. This fictionalized memoir of Coetzee’s early life growing up in South Africa is followed by Youth, next on the reading list. Monday morning I proceeded to come down with it: my eyes started to irritate, a headache descended, my ears felt funny and I definitely felt feverish. I dashed over to the chemist to buy a top of the range one-second thermometer - I’d wanted one for years, now was the perfect time - and stuck this new fangled must-have in my shell like: it was down! I couldn’t believe it: 36.3, not a single digit over 37. Still, I felt dog rough. Home beckoned, appointments cancelled for the rest of the day, sheets pulled over my head and sleep came instantly. Tuesday morning, after a hearty breakfast, I settled in for a day’s rest (I still felt awful, I can assure you) and started reading: I finished Boyhood (it was excellent), got stuck into Youth and noted, with delight, that part three, Summertime, is due out in September. It seems that I’m one of the lucky ones. Whatever it is, it’s not going to lay me low for long and John Maxwell Coetzee has been such good company that the time has passed quickly. The last word, I will leave to the enigmatic Hunter S. Thompson who wrote, "In a nation ruled by swine, all pigs are upward-mobile; and the rest of us are fucked until we can put our acts together: not necessarily to win, but mainly to keep from losing completely. We owe that to ourselves and our crippled self-image as something better than a nation of panicked sheep." A classic is a book that doesn't have to be written again, according to Pulitzer Prize winner Carl Van Doren. I mean who would want to alter a word of David Copperfield? How could anyone resist the lyrically formed Jane Eyre? Who would dare cut a single page from Anna Karenina? When I had read everything from the pen of Jane Austen, I went into a blue funk, wanting more of her deceptively simple tales of families, disappointments and love. Through the occasionally gloomy Thomas Hardy, I met with the unfortunate Jude Fawley, trapped in a loveless marriage; the young and tragically beautiful Tess driven out of her home through poverty; and the despicable Michael Henchard who sold his wife and baby daughter for five guineas at a country fair. Ruth, a fellow traveller in the book world, loves a good yarn. Her nose is permanently stuck in something gripping, the eerie underworld of crime reaching out and drawing her in. And she’s not averse to a spot of romance, or even a tale of wanderlust in the back of beyond. But for the last week she’s been stuck into The Three Musketeers by Alexandre Dumas – a thick wedge of a book, brim full of action and adventure. "Oh, it’s much better than the film", she murmured before sinking back into a slump, eyes racing across the page, all further conversation a distraction to this passionate reader. I don’t expect to have a proper conversation with Ruth for some time; she’ll be far away in 19th century Paris with D’Artagnan and his friends Athos, Porthos and Aramis, fighting duels, crossing the English Channel, getting mixed up in politics, consorting with criminals and Countesses all while avoiding the evil eye of Cardinal Richelieu. So, if you’re in between books with nothing new on the horizon, choose a classic – they come in every size, cater for all tastes – and tear yourself away from your present woes. You could dive into a tempestuous romance, discover the delights of David Copperfield (my favourite book ever), or enter a world where it’s un pour tous, tous pour un! There’s a box in my attic full of books. I don’t have room for them on the shelves downstairs but I can’t throw them out. So, they sit up under the eaves – boiling in summer, freezing in winter – growing as old as my children, each year another step away from when they were treasured, cover to cover. Sometimes we take them down, just for old time’s sake, to read through again, to bring that time alive when we were all much younger and life was definitely simpler. Way back then, I’d read, each night – one, two, three stories – until my voice would start to croak. They’d lay their heads down ready for sleep but keep their glazed eyes open, watching each page flip over to the next, remembering every single word, every picture, every nuance. Like The Cat in the Hat, who was oh so bad he drove everyone completely nuts, and then he had the temerity to come back and create even more havoc! Would you believe it??? I’d say, and they’d nod furiously in complete agreement. But I laughed out loud – along with my boys - every time I read Who’s a Pest? a story that followed young Homer whose hat completely enveloped his head so that all you saw was his confusion as he got into impossible situations – absolutely none of which were his own fault. And then there was Benjamin’s 365 Birthdays, the girls’ favourite, in which this young bear discovered an ingenious method of ensuring there was a birthday present at the end of his bed every single day of the year. We thought he was marvellous, his idea absolutely brilliant. I have just climbed up into my attic to retrieve these tattered treasures to share them with you. I wonder what story-books you have stored away, in remembrance of times past. Good old Groucho Marx, always reliable for a pithy quotation when you need one! After wading through an indigestible "best seller" I got to thinking about the common misconception that everyone has a book inside them. Sometimes it would be better had it indeed remained so - inside them. When an aspiring writer (who’d probably never put pen to paper in her entire life) said that she could have easily written one of the visiting author’s hugely popular novels, Maeve Binchy, the culprit in question replied: "Well why don’t you?" Still, we can all dream. And while we dream we buy endless books on the subject of writing: How to Write a Novel! How not to Write a Novel! How to Publish your Book! How to make Money from your Writing! The list is endless, the advice is plentiful, but the difference between those who write and those who don’t is bums on seats; it’s often as simple as that. Some write with a pen, others clack away on old typewriters, while computers have spawned bloggers to beat the band. The first classic to be hammered out on a typewriter was by Mark Twain while Jack Kerouac used a telex for his one page wonder, On the Road. Nowadays, we have every kind of convenience to help us hammer those words out while my good friend, Alice, in Greystones by the sea, writes her marvellous short stories with a pencil on any available scraps of paper to hand. Stephen King’s brief memoir entitled, On Writing, gives us a mere glimpse into his world where he churns out huge doorstoppers of novels that sell in their millions and are then turned into block busting movies. Everyone wants to know how he does it, what his secret is and so they buy his book and find that he sits at home, putting in the hours, honing his craft and filling the blank pages. It’s the same with all successful writers: we want to know from where they get their inspiration. One of my favourite books is a novella by Alan Bennett, The Uncommon Reader. When I read the blurb on the jacket I wasn’t too keen, but I should have trusted this author who has a vivid imagination and a delicate mastery of the English language. It’s about reading, and books and opens with the Queen of England walking the corgis outside the kitchen garden where a mobile library is stationed. In she pops and starts a love affair with all things literary, even going so far as throwing a garden party for those who make their living by the pen. When she sidles up to a certain Scottish author to ask him, politely, where he gets his inspiration from, he replies, rather tartly: "It doesn’t come, Your Majesty. You have to go out and fetch it." I know plenty of people who write far better than I do. But I put in the hours, banging out words, shaping them, putting them in some reasonable order, working with my limitations and filling the page. I may never have the word ‘author’ in my passport but I sure as hell am going to keep on trying. The queue went round the drab soulless room as we all shuffled against each other, bopping up and down from chair to chair, squeaking on the wooden floor, waiting to speak to the civil servant in charge. Housing benefit, rent allowance, mortgage relief, all payments to help keep a roof over our heads. More of life’s down-at-heel joined us, trailing out the door and down the stairs, sitting and standing in silence as if a large sign hung over the door: QUIET PLEASE OR ELSE WE WON’T HELP YOU! A book, stuffed in my bag as I left the house, became my refuge in this vigil; we were in it for the long haul, no one would escape until they had gone on their knees to beg, one more time, for the most basic of help. I’d get it or I wouldn’t get it but I was damned if I was going to sit there and worry about it. Out came the book, My Family and Other Animals, and I got stuck in. It wasn’t long before I snorted with laughter at some ridiculous situation that Gerald Durrell found himself in. I quickly suppressed my giggles, back to the story, back to Corfu and mother and a succession of creatures that would make me scream had they appeared from under my bed. Silent again, but not for long, as another helpless titter escaped from my otherwise sealed lips. And so it went on as Durrell did his level best to make me howl with laughter. It was as if he was sitting there tickling me while whispering hilarious jokes in my ear. Nearly two hours later I left the building, cheque in hand, sidelong glances following me as I escaped, probably wondering what substance I was on or which institution had let me out for the day! Paul Valery certainly knew what he was talking about, and he was born way back in 1871. The weather gave Raven Books a hard time recently; “the dog ate my homework” is an excuse that is sometimes true (cats just sit on them); humidity is a big problem in many areas of the world; and as for content, well, books are still being banned for the most ridiculous reasons; but fire is the one terrifying reality that can happen in the blink of an eye, anywhere, anytime. When we were young and foolish with two young children, a willing babysitter was like manna from heaven. Out we went one such eventful night, along De Vesci Place, down York Road, left on Lower Georges Street and into the nearest hostelry for a pint of plain, half a lager and a packet of crisps after which we ambled home again, arm in arm. As we turned in through the old gated archway we spied the fire brigade in the distance; uniformed men (no women then) marching briskly in and out of some poor unfortunate’s home (probably the old folk next door, we muttered), a long hose stretched snakelike, gushing its contents on some idiot’s reckless fire. We giggled, tut tutting about careless behaviour, walking innocently up that path until we arrived at number 3 and gazed downward through the large picture window of the basement flat, our home, where hunky firemen flashed in and out of view. It seems our sitter had banked the fire up high setting the chimney ablaze. When she ran up to tell our landlord, to use his phone to call for help, she accidentally locked the door behind her with both babes fast asleep inside. All’s well that ends well but it got me thinking about many things: the benefits of having a phone, never going out again until my children were over 21! and wondering what I would save first – apart from my beloved family, of course – in the event of such a disaster ever occurring again. 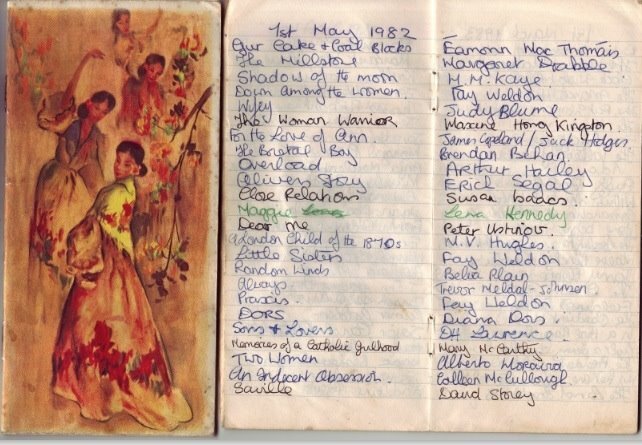 It would have to be four notebooks filled with lists of all the books I have read since Christmas Day, 1966, when I was fourteen years old. 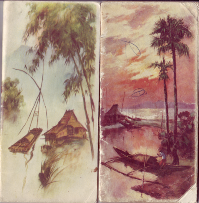 My mother gave the notebooks to me and after much time debating about what I’d write in these pristine pages, I settled on noting down the date at the top of each page, then the title and author of each book after I had read them. Looking back is like reading a diary, every title conjuring a memory, every year seeing how my tastes have changed and evolved over time. Jessica reached into her backpack, pulled out The Dice Man by Luke Rhinehart and started reading aloud. She read an entire chapter as a gentle breeze flapped against the open tents. Her audience lay down, listening to this adult bed time story. She read until the sky darkened and turned to dusk, until her three listeners had almost fallen asleep, while they relived their own private memories of being read to as a child.